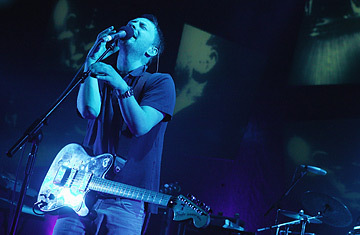 Thom Yorke performs with Radiohead at the Carling Apollo Hammersmith in London, England. Roughly 12,000 albums are released in an average year, so the announcement late Sunday night that the new Radiohead record, In Rainbows, will be out Oct. 10 is not itself big news. Sure, Radiohead is on a sustained run as the most interesting and innovative band in rock, but what makes In Rainbows important  easily the most important release in the recent history of the music business  are its record label and its retail price: there is none, and there is none. In Rainbows will be released as a digital download available only via the band's web site, Radiohead.com. There's no label or distribution partner to cut into the band's profits  but then there may not be any profits. Drop In Rainbows' 15 songs into the online checkout basket and a question mark pops up where the price would normally be. Click it, and the prompt "It's Up To You" appears. Click again and it refreshes with the words "It's Really Up To You"  and really, it is. It's the first major album whose price is determined by what individual consumers want to pay for it. And it's perfectly acceptable to pay nothing at all. Radiohead's contract with EMI/Capitol expired after its last record, Hail to the Thief, was released in 2003; shortly before the band started writing new songs, singer Thom Yorke told TIME, "I like the people at our record company, but the time is at hand when you have to ask why anyone needs one. And, yes, it probably would give us some perverse pleasure to say 'F___ you' to this decaying business model." On Sunday night, guitarist Jonny Greenwood took to Radiohead's Dead Air Space blog and nonchalantly announced, "Hello everyone. Well, the new album is finished, and it's coming out in 10 days. We've called it In Rainbows. Love from us all." While many industry observers speculated that Radiohead might go off-label for its seventh album, it was presumed the band would at least rely on Apple's iTunes or United Kingdom-based online music store 7digital for distribution. Few suspected the band members had the ambition (or the server capacity) to put an album out on their own. The final decision was apparently made just a few weeks ago, and, when informed of the news on Sunday, several record executives admitted that, despite the rumors, they were stunned. "This feels like yet another death knell," emailed an A&R executive at a major European label. "If the best band in the world doesn't want a part of us, I'm not sure what's left for this business." Labels can still be influential and profitable by focusing on younger acts that need their muscle to get radio play and placement in record stores  but only if the music itself remains a saleable commodity. "That's the interesting part of all this," says a producer who works primarily with American rap artists. "Radiohead is the best band in the world; if you can pay whatever you want for music by the best band in the world, why would you pay $13 dollars or $.99 cents for music by somebody less talented? Once you open that door and start giving music away legally, I'm not sure there's any going back." The ramifications of Radiohead's pay-what-you-want experiment will take time to sort out, but for established artists at least, turning what was once their highest-value asset  a much-buzzed-about new album  into a loss leader may be the wave of the future. Even under the most lucrative record deals, the ones reserved for repeat, multi-platinum superstars, the artists can end up with less than 30% of overall sales revenue (which often is then split among several band members). Meanwhile, as record sales decline, the concert business is booming. In July, Prince gave away his album Planet Earth for free in the U.K. through the downmarket Mail on Sunday newspaper. At first he was ridiculed. Then he announced 21 consecutive London concert dates  and sold out every one of them.